Why Buy Ticket For AHL All-Star Game At PPL Center? Home › Phantoms Hockey › Why Buy Ticket For AHL All-Star Game At PPL Center? Truth of the matter is, I am probably not the very best person to ask this particular question largely because, simply put, I’ve pretty much always been a “national team” guy, myself. Go ahead and blame it on a combination of the 1979 Challenge Cup at Madison Square Garden in New York City, a best of three series between the Soviet Union’s elite players and the National Hockey League All-Stars, the unforgettable 1980 Winter Olympic Games at Lake Placid as well as the 1981 Canada Cup tournament that concluded with the USSR trouncing the host nation 8-1 in the final. But that would be an entirely different story. I certainly do, however, recognize the obvious historical significance of the American Hockey League holding what will be the 30th installment of its annual All-Star Game at the almost three-year-old PPL Center, which is, of course, located quite literally a stone’s throw away from the very same church on Hamilton Street that sheltered the iconic Liberty Bell from King George III’s plundering British Army during the American Revolution. AHL and NHL All-Star Games : Are They Necessary? Even though the piece originally published by the online digital site, MassLive.com, is five years old, its fundamental points are as spot on, as ever. With the benefit of hindsight, I found it most interesting to note that Landon said at the time that Springfield Falcons up and coming winger Cam Atkinson was “destined to have a long NHL career”. Sure enough, after appearing at the 2012 AHL All-Star Game played in Atlantic City, the former sixth round NHL draft choice from Boston College established himself as an NHL regular with the Columbus Blue Jackets the very next season and has scored at least twenty goals in each of his last four campaigns, including this current one, ever since. 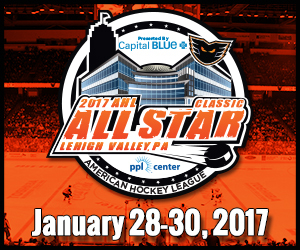 While it is accurate to say that almost all of the participants at this year’s 2017 AHL All-Star Game will skate at the National Hockey League level at some point over the course of their respective careers, it is also accurate to say that the majority of the players who will be appearing at the PPL Center in Allentown early next week are never going to develop into genuine NHL regulars for any considerable length of time. Of the 46 players who took part in the 2015 AHL All-Star Game two years ago, only fourteen can be considered ‘regulars’ on NHL rosters this season while twenty are still in the AHL; ten actually began this term in Europe although former Hershey Bears playmaker Tim Kennedy departed Swedish elite league club HF Lulea in mid-December and has been skating with the Rochester Americans ever since. A review of other AHL All-Star Games will always yield somewhat similar numbers with respect to where the players ultimately end up — but it is the uncertainty of never really knowing for sure just exactly who will “pan out” at the NHL level which always gives the American Hockey League’s showpiece event a very large part of its allure and attraction. Brandon Manning, the undrafted 26-year-old defenseman who has been an NHL regular with the Philadelphia Flyers for the past two seasons now, was the fledgling Phantoms’ one and only representative at the 2015 AHL All-Star Game in Utica during Lehigh Valley’s inaugural campaign in the American Hockey League. This term, a vastly improved edition of the Hamilton Street Heroes is scheduled to have no fewer than three of its players at the 2017 AHL All-Star Game in Allentown : high scoring center Jordan Weal, still developing winger Taylor Leier and top shelf minor league defenseman T.J. Brennan. At this precise point in time, can anybody really say for sure exactly where any of these players will be lacing up their skates during the 2018/19 season? I must admit, I definitely never thought the blue collar Manning would be able to stick around at the NHL level for what is going on two full seasons now. And I do not think the 22-year-old Leier, who has already skated in 16 NHL games (one goal, one assist) over the course of his two and a half terms as a professional thus far, will ever be anything more than an “energy”/ checking line player at best in what is by far the most talent laden and competitive league anywhere in the world. But, again, as acknowledged just a moment ago, I have been wrong before — very much like the pro scouts and other front office personnel have clearly proven themselves over the years as easily evidenced by some of the first round NHL Draft picks that have gone into the books. Perhaps the biggest bottom line revolving around the upcoming 2017 AHL All-Star Game at the PPL Center is the fact that this event is guaranteed to be a massive “occasion” here in the Mecca Of Minor League Sports. One must bear in mind that back when legendary United States head coach Herb Brooks and his “university students” were busy collecting gold medals at the Winter Olympics almost forty years ago now, there was no such thing as an AHL hockey team known as the Lehigh Valley Phantoms or an ice rink located at the intersections of Seventh and Hamilton Streets in Allentown. And maybe that concept, in and of itself, is the very best reason to head on down to the box office or jump online right away. We can speculate about why so many seats are available–it’s a broad subject for an upcoming post, perhaps. But the fact remains. How many? I’m not sure because I’m not privy to the exact inventory. But rest assured if you want to get in on this event weekend, you can get nice seats for the individual events by going to PPLCenter.com and looking for the links to All Star Weekend. So don’t delay: If you’re thinking about going, grab some seats and we’ll see you there. If for no other reason than this event won’t likely return here until most other AHL arenas have had their chance at hosting–and that’s potentially a long, long time.